Acrylic onunstretched, frayed canvas, Nailed to the cover of a crate. Initialled lower left: M. Inscribed on the back of the crate: MIRÓ. /31/5/60. J. Dupin, Miró, Flammarion, Paris 1961, no.953, p.556. Y. Taillandier, Creación Miró 1961, Editorial RM, Barcelona 1962, p.38 (col). A. Cirici, Miró-Mirall, Polígrafa, Barcelona 1977, no.241, p.215. R. M. Malet, Obra de Joan Miró, Fundació Joan Miró, Barcelona 1988, no. 1004, p. 262. 1964. London, The Tate Gallery – Zurich,Kunsthaus, cat. no. 209. 1968. Saint-Paul, Fondation Maeght, cat. no. 55. Barcelona, Antic Hospital de la Santa Creu, cat. no. 58, repr. p. 113. 1975. Barcelona, Fundació Joan Miró, cat. no. 36. 1980. Mexico City, Museo de Arte Moderno, cat. no. 37. 1999. 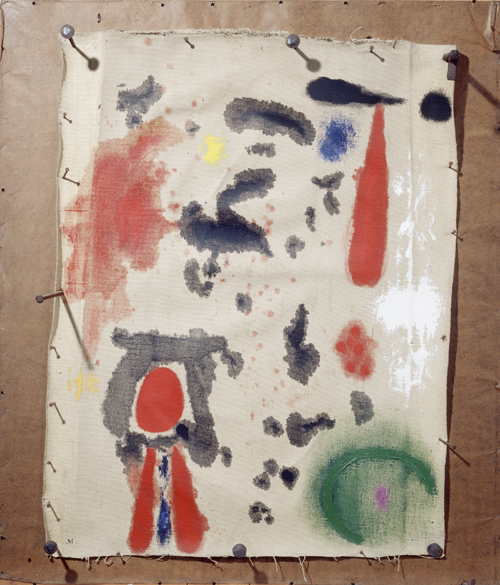 Paris, Galerie Lelong: "Joan Miró. De lʼassassinat de la peinture," cat. no. 3, repr. p. 31 (col).